Hamburg’s Kunstverein Harburger Bahnhof (Kv.H.Bf.) is bringing in artist Hannah Weinberger for a new solo exhibition titled AS if I become upside down, right side up and running from April 17 to July 26. Weinberger primarily works with sound, sculpture, performance, and video, using participatory and collaborative methods that extend beyond traditional exhibition formats. In employing network-based open-source programs as a technical prerequisite for her sound compositions, she draws attention to the “collaborative creative power in times of changed production and distribution channels”. 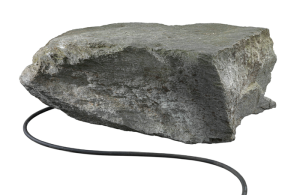 AS if I become upside down, right side up, Weinberger’s first solo exhibition in Germany, brings an installation of six major Swiss boulders, created hollow and serving as amplifying speakers for her digital media, including field recordings of social background noise and ambient sounds. The mix of hollow natural stones and volatile, synthetic sounds creates a fascinating exploration of the old nature vs. culture debate through the medium of sound.